The Pink shade of the National Bank Note Company 3¢ 1861 Issue was produced only in the early printings released in the fall of 1861. The shade is distinctive, and in its true form can easily be distiniguished from the other shades. The Pink is prone to transformation through light exposure, and in some cases can lose its special vibrancy. 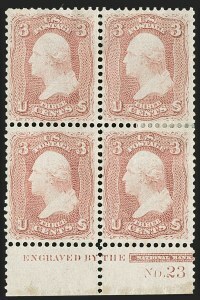 Unused and original-gum examples of the 3¢ Pink are very scarce, and multiples are rare. It has been reported that a sheet was owned by George Walcott, a collector during the early part of the 20th century, and that John Klemann, a dealer at the time, purchased the sheet and divided it into blocks and singles. 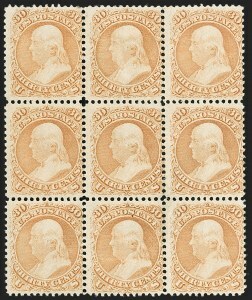 Many of the stamps with original gum have similar centering and color, as well as vertical creasing, which suggests that the account of a Walcott-Klemann sheet is factual, but no other imprint or plate number multiple from that sheet has been reported. Writing in the October 1892 American Journal of Philately, Mr. Luff gave the history... At that time Mr. 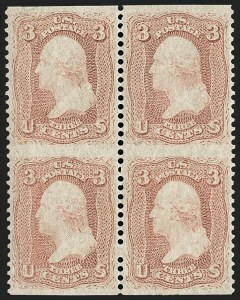 Luff resided in San Francisco, Calif. and he related how two blocks of the 3¢ 1861 PINK had been discovered "among the papers of a lawyer in National City, Calif." who sold them to San Francisco dealers. Mr. Luff stated, quote: (there) "were two blocks of twelve, each bearing the imprint xxxx No. 12 plate. I am happy to say one of these blocks adorns my collection." If there was a second plate block in 1892, it has been lost to philately. Elliott Perry, who acquired this block for Waterhouse in the 1933 Hind sale, is also quoted stating that it did not have gum at that time, despite the sale catalogue describing original gum. Original-gum and unused blocks of the ungrilled 10¢ 1861 Issue are extremely rare. This is the only recorded 10¢ 1861 plate block, except for the Type I plate block of four (sold in the Gross U.S. Treasures sale) and a plate block of eight of Scott 68 with "Specimen" overprint. One imprint and plate number strip of four of the 10¢ F Grill is recorded and offered in this sale as lot 88. 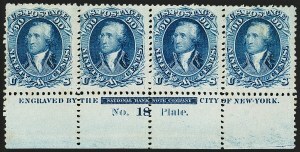 The color chosen for the 24¢ stamp issued from 1861 through 1868 proved to be a challenge for the National Bank Note Company's plate printers and ink mixers. The early shades of Violet and Steel Blue gave way to Deep Red Lilac and the brighter tints of Brownish Lilac and Lilac. As printings continued in 1863, the shade turned grayer, until it reached Grayish Lilac and Gray. 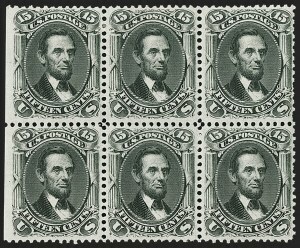 The stamps that were grilled in 1868 and 1869 (F Grill, Scott 99) are only known in these two shades of gray. Due to the subjectiveness in assigning colors, this remarkable imprint and plate number block has been misidentified in the past. In the three auctions cited here, it was identified as Scott 78 (Lilac) or Gray Lilac (Scott 78a)--we agree with the latter classification. In 1981 the block was certified by The Philatelic Foundation as Brown Lilac, Scott 70a, which is in error. The Chapin census based the entry for this block (no. 252) on this incorrect certificate, but correctly listed the other two imprint and plate number multiples as Scott 78 (nos. 276, strip of four, and 276A, block of four). 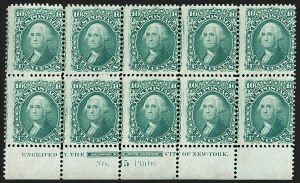 Only one plate was used to print the 24¢ (Plate 6). 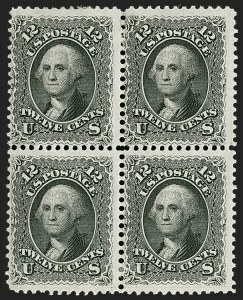 If all 24¢ shades and the F Grill stamps are considered (excluding proofs and "Specimen" overprints), there are just four unused plate number multiples extant: the 24¢ F Grill (Scott 99) plate block sold in the Gross U.S. 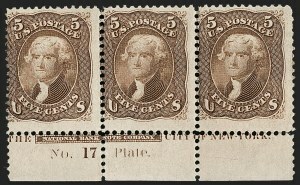 Treasures sale, this block of 6 (Scott 78a), a strip of four and a block of four in Grayish Lilac/Gray shades (Scott 78/78a). Original-gum and unused blocks of the 30¢ 1861-68 Issue are extremely rare. We record two unused plate number strips of four: the strip offered here and another that emerged in 2012 with the sale of the Frelinghuysen collection (Siegel Sale 1021, lot 220). There is also a plate block of eight with "Specimen" oveprint. 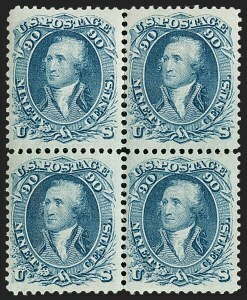 This strip was reduced from eight to four stamps. When the National Bank Note Company won the contract to print stamps, they had already designed the 1861 Issue, engraved the dies and made eight plates for each denomination, and printed sheets of "sample labels" to submit as part of the competitive bidding process. The First Designs (1¢, 3¢, 5¢, 10¢, 12¢ and 90¢) and First Colors (24¢ and 30¢) were followed by a second set of stamps made from modified dies and plates. The differences between the first and second designs are very noticeable on the 3¢ and 12¢, but more subtle for the other four denominations. The 24¢ Dark Violet and 30¢ Red Orange colors are unlike any of the issued stamps. All were printed on a thin semitransparent stamp paper--some were gummed with a dark brownish gum and perforated. 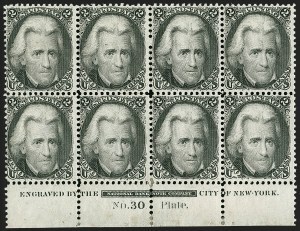 These stamps and the associated trial printings are listed in the Scott U.S. Specialized Catalogue in a separate section (pages 913-915 in the 2019 edition). Only the 10¢ First Design (Type I) was issued through post offices. The others from the trial printing were distributed through other channels. The 3¢ exists in a much larger number than the others, and comes in various shades, which indicates that a cache was released from the printer's files. The 1¢, 5¢, 12¢, 24¢, 30¢ and 90¢ are great rarities, and the discoveries of examples in other countries suggests they were released through government Post Office notices of the new issue. For example, one complete set was discovered in Europe and sold in a 3/15/1906 Morgenthau auction of the Scholle collection. The design of the 90¢ 1861 adopted the previous issue's Trumbull portrait of a youthful General Washington in uniform, but added "90" numerals to make the denomination more obvious. The same deep blue color was chosen for the top value, but the perforation gauge was changed from 15 to 12, and the holes were enlarged. It is believed that the new plates were made to widen the spaces between stamps to accommodate the larger perforation holes. Two 90¢ plates were made: Plate 8 from the First Design die, and Plate 18 from the modified die. To the best of our knowledge, not a single example of the Plate 8 imprint exists in any form (proof, specimen or stamp). 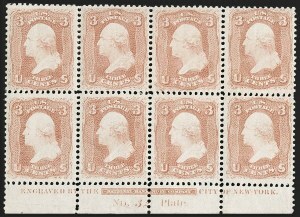 Only two Plate 18 stamp multiples are known: the strip of Scott 72 offered here and a plate block of eight with the "Specimen" overprint. Plate proofs on card with the imprint and plate number 18 are also known. 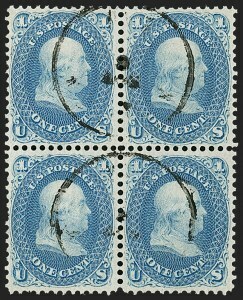 There are approximately ten blocks of the 90¢ 1861 with original gum that are centered strongly to upper left, have similar dark color, and have malformed perforation holes, the result of the pins failing to fully punch through the thick paper on which these stamps are printed. These 90¢ blocks undoubtedly came from the same sheet. This block is unlike that group of off-center blocks. Its distinctive bright shade, precise centering and fully formed perforations are desirable characteristics not found among the other known multiples, except for one that no longer exists as a block. It is found in the Henry B. Close sale (Eugene Costales, 6/23-26/1952, lot 185), and was offered later in the 1969 Rarities of the World sale (Sale 350, lot 76). It has identical centering and color, and we are confident it joined the block offered here in the original sheet. It was divided into singles after its 1969 Rarities sale appearance. The block in this sale was acquired by Robert Zoellner from our firm in a private transaction. When the Zoellner collection was offered in 1998, Mr. Gross was the buyer. 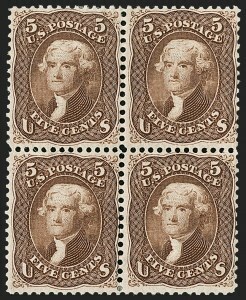 One of two recorded plate number multiples of the 1863 5¢ Brown without "Specimen"
Unused blocks of the 5¢ 1861-68 Jefferson stamps, in any shade and grilled or ungrilled, are rare. 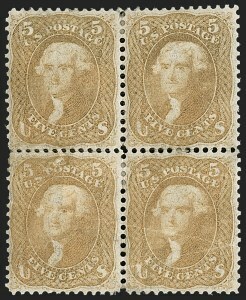 The only plate number multiples are a plate block of eight of Scott 76 with "Specimen" overprint, a Scott 76 plate strip of four (Siegel Sale 422, lot 204), and the strip offered here. The only other recorded plate number multiple is the 5¢ F Grill (Scott 95) block of six offered in this sale as lot 86. The national year of mourning for Abraham Lincoln came to an end on April 14, 1866. During that period, many appeals were made to postal officials to issue a stamp with Lincoln's likeness. In October 1865 the first stamp to portray the martyred president was issued--the 25¢ Newspapers and Periodicals (PR3)--but that stamp was intended for use on bundles of newspapers distributed by publishers, not on ordinary letter mail. The first regular postage stamp honoring Lincoln is the 15¢ Black (Scott 77), issued on April 14, 1866. This date has been established through analysis of contemporary sources, but was not a "first day of issue" in the philatelic sense. The Lincoln stamp was designed by James Macdonough of the National Bank Note Company. The vignette, adapted from photographic portraits taken by C. S. German in 1861 and Matthew Brady in 1862, was engraved by Joseph P. Ourdan (1828-1881). Ourdan was a highly-skilled engraver who later became chief of the Engraving Division of the Bureau of Engraving and Printing. The frame was engraved by William D. Nichols. 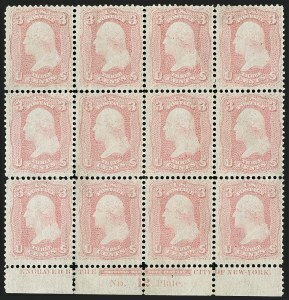 The stamps were printed from Plate 41 in sheets of 200 (two panes of 100). A total of 2,139,000 of the 1866 stamps were issued. 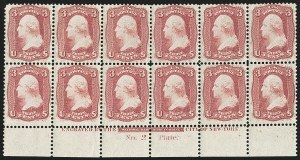 Today, the largest known unused multiple of Scott 77 (the ungrilled stamp) is a block of 12 without gum. The largest known multiple with original gum is a block of six, represented by two recorded blocks. The block offered here is by far the better centered of the two, and, in fact, is superior to the few surviving blocks of four.